It's not too often that someone gives me a galley of an upcoming cookbook to check out, so I felt that Crossroads by Tal Ronnen deserved a full blog review. So, here goes. If you follow food news at all, Crossroads is the vegan cookbook you're going to be hearing a whole lot about come October when it's officially out. Tal Ronnen is chef/owner of the restaurant Crossroads in LA, probably the USA's paramount gourmet vegan restaurant. Ronnen also knows Oprah and lots of food celebrities, so I expect the book to do well regardless of quality. Fortunately, the quality is there. The book appealed to me because Ronnen promises "vegetable-centric" cooking. Far too many vegan cookbooks are obsessed with meat and dairy substitutes; we've long needed a vegan cookbook which was aimed at people who love vegetables. Appropriately enough, the book's cuisine is "Meditteranean", including a lot of Middle-Eastern food, possibly the most vegan-friendly cuisine there is. So, does the book deliver on its promise of "vegetable-centric" vegan recipes? Mostly. Ronnen is also the founder of Kite Hill Cheese, a vegan faux-dairy-product vendor, and he uses its products liberally through the book in a quarter to a third of the recipes. If you're vegetarian and not vegan, though, these recipes easily adapt to using the real thing. Strangely, he also goes off the vegetable-centric road in the pasta section, where his fresh pasta recipe and almost every pasta dish is rife with tofu and Kite Hill dairy. Not sure what happened there, given that a regular Italian cookbook has vegan pasta dishes in it. The other question, of course, is are the recipes any good? And I'm happy to report that yes, they are. 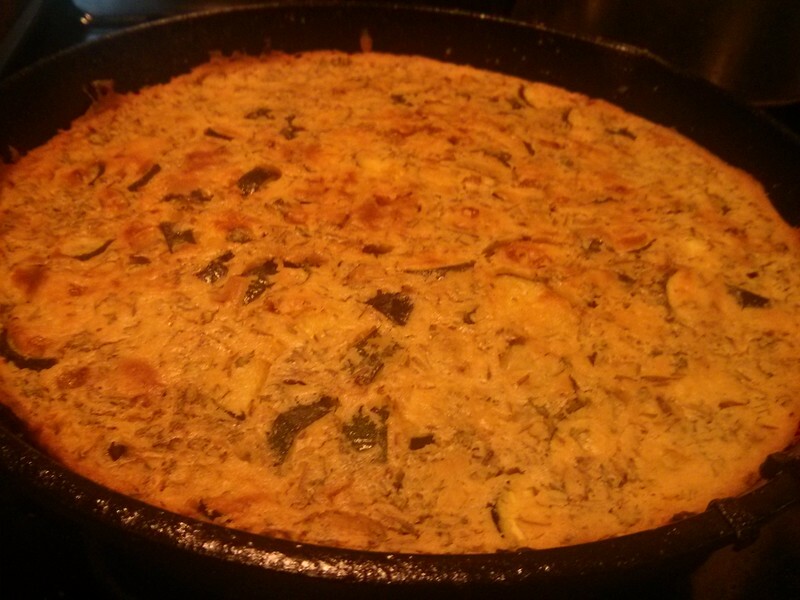 Pictured above is the squash farinata in the pan; this was tasty, substantial, and kept well as leftovers. The food, as mentioned, is Mediterranean, and a lot of that is fusion cooking. For example: Charred Okra Flatbread with Sweet Corn Puree; Balsamic-roasted Mushrooms with Toasted Marcona Almonds; Tagine Flatbread. As with other current trendy cookbooks, there is a cocktail section. The recipes are clearly written and fully explained. Aside from Kite Hill products, they are all from-scratch cooking, including recipes for flatbread dough, tomato jam, and fresh pasta. While the recipes are complex, each step is explained and Ronnen seldom expects any specific culinary knowledge of the reader. This is fancy-restaurant cooking though; most recipes have 12 or more ingredients, and some many more than that. You can also tell it's from California given the reliance on specialty produce which may be difficult to find elsewhere in North America. Most of the recipes are "cook to impress" recipes; weekend and not weeknight cooking. Overall, I'd say that this cookbook is one we've been waiting for: a truly gourmet vegan cookbook which will even appeal to non-vegans. It may do for vegan cuisine what The Greens Cookbook did for vegetarian. If you are a vegan, or cook for one, you'll want to buy Crossroads this fall.